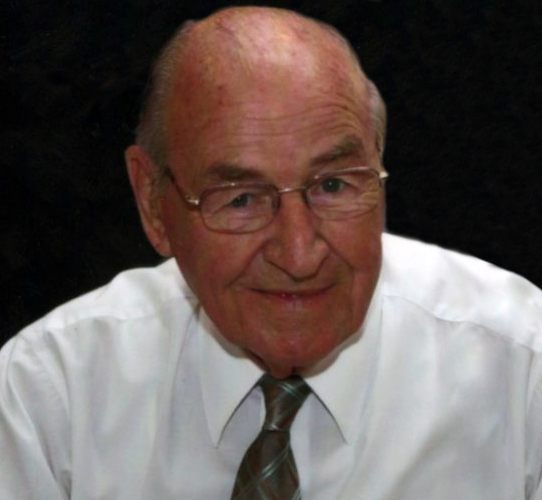 Obituary for James L. Razenberg | Langeland Family Funeral Homes, Inc.
James L. Razenberg, age 92, was called home to his Lord and Savior on Thursday, November 29, 2018. Jim was born August 5, 1926, in Kalamazoo, MI, the son of Adrian and Gertrude (Klimp) Razenberg and was a lifelong Kalamazoo area resident. He served in the U.S. Navy during WWII from 1944-46. Jim was a longtime active member of Heritage Christian Reformed Church, where he served on the church council. He was a partner in Daleiden's Inc. for many years and retired as President of the company in 1998. Jim's love of cars, trucks and tractors was a vital part of his life. He was known as a very kind and gentle person, and he thoroughly enjoyed spending time at Eagle Lake with his family. Family was a very important part of Jim's life. On January 24, 1947, he was united in marriage to Evelyn (Peachey) Razenberg, who preceded him in death on October 15, 2005. He was also preceded in death by his parents and his brother John Razenberg. On January 16, 2009, he was united in marriage to Marian (VanderMeer) Razenberg, who survives. Also surviving are their children Lynn (Ric) Hoyt, Jan (Larry) Westrate, Bob (Barb) Razenberg, Janice (Curt) Brinks, Marjorie (Paul) Booden, Sally (Mark) Huyser, Jack (Mary) VanderMeer, Daniel (Deb) VanderMeer; twenty grandchildren; thirty-eight great-grandchildren; a sister Clarissa Ekema; nieces and nephews.